became the first four members of the group known as “Blues Ensemble”. a top seven-piece outfit playing the best in blues and soul. a promising young trumpet player, and organist Barry Lunn, ex Misphits. All that was missing now was the right man to front the band. from the top Wolverhampton group The ‘N Betweens (later to become Slade). It was at this point that the band was ready to progress and advance its music. 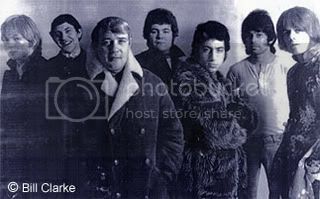 with the Walker Brothers’ Recording manager Johnnie Walker in charge. Frank Rudge from Giorgio and Marcos Men. of “The Wellington Kitch Jump Band” under the successful management of Jim Simpson. After returning from Germany the band made one more change. Drummer Roger Hall left the band and was replaced by the up and coming Charlie Grima. i.e. The Platters, The Impressions, and the very successful Garnet Mimms. The band had now risen to new heights and were possibly one of the top three bands in the Midlands. came in and the band was ready for a return to Germany, this time a tour of Berlin. recording session took place and a future number one was all but guaranteed. the record was shelved and never released. Because of this the band started to decline. 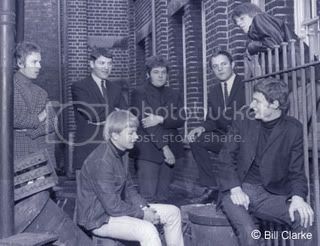 Within weeks John Burnett, Frank Rudge and Barry Lunn all left the band. Roger Hall. With some new replacements the band carried on until the end of the year and then disbanded. (this bit of info was sent by John Hill). and is now teaching music in Kent. John Howells went on to do his own thing and is still singing in his own band. this exclusive story of the Wellington Kitch Jump Band. Is John Howells still performing? If so what is the name of the band… Would love to get in touch with him and Jean…. Pass details to Sandra Cox Thank you!